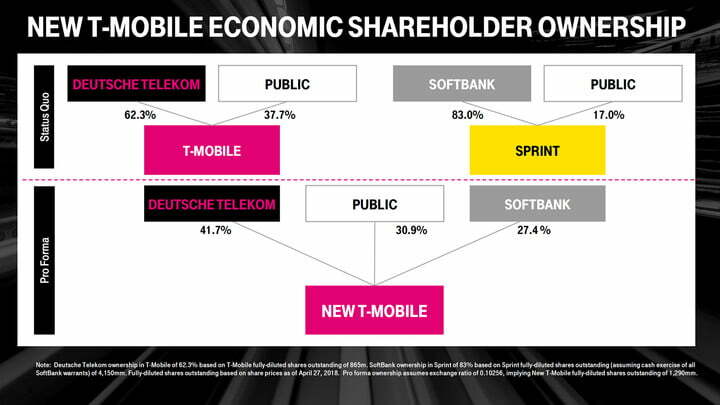 The merger of T-Mobile and Sprint, the third and fourth largest carriers in the U.S., has been close to happening for several years, and the time has finally come. The mobile carriers submitted a formal application to the Federal Communications Commission on June 18, officially beginning the regulatory review process for the $26 billion deal. In April, T-Mobile CEO John Legere took to Twitter to officially announce the merger, saying the two companies “have reached an agreement.” He posted a video alongside Sprint CEO Marcelo Claure giving some details on the merger. The combined company will have more than 126 million customers, seeing it close in on rivals AT&T with 141 million subscribers and Verizon with 150 million. The merger could also mean an improvement in overall 5G wireless technology, which promises greater, pervasive connectivity and faster speeds, but which involves costly and complicated development efforts. On July 19, the commission announced that it is officially accepting petitions to deny the merger between T-Mobile and Sprint. Both petitions (that can be filed by anyone) to deny the deal and formal comments are due on August 27, and can be submitted on the FCC’s docket page — you can also find a list of filings from others. From there, oppositions to the petitions will be due on September 17 and replies are due on October 19. As for when a decision will be issued, the FCC has created a 180-day timeline to review the merger but aren’t required to give an answer once those days are up. In fact, now that it has paused that timeline, it’s unclear as to when we’ll hear a final decision.